Transcription: Think it over. 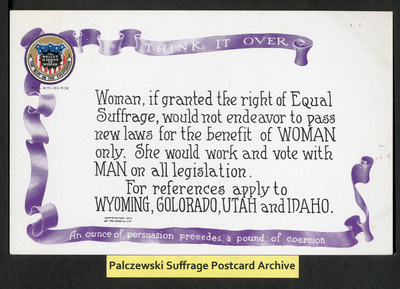 Woman, if granted the right of Equal Suffrage, would not endeavor to pass new laws for the benefit of WOMAN only. She would work and vote with MAN or all legislation. For references apply to WYOMING, COLORADO, UTAH, and IDAHO. An ounce of persuasion precedes a pound of coercion.